A white woman accused a 9-year-old black boy of grabbing her backside in a Brooklyn deli on Oct. 10 but two days later, after watching surveillance videotape, admitted that the boy had accidentally brushed up against her possibly with his bag. "Young man, I don’t know your name, but I’m sorry," she said. A field marshal at a teen soccer game in Florida called police on Oct. 14 after a father told his son from the sidelines that the referee was right. The woman at the game, in St. John's County, informed the father that "harassment won't be tolerated." The father tried to explain that he was speaking only to his son not to the referee, which is not allowed, and started to the leave the game to defuse the encounter but she called police anyway, characterizing his behavior threatening. A sheriff's deputy told the father he had no reason to detain him. A white neighbor tried to block a black man from entering his loft in downtown St. Louis on Oct. 12, asking him which unit he lived in and following him to his apartment. D'Arreion Nuriyah Toles told her that he had already entered the building. Police later arrived at his door. The woman was fired by her employer, Tribeca-STL Management, a property management company and Toles told the St. Louis Post-Dispatch that he was looking into his legal options. In April, a white woman called police to complain about black residents barbecuing at Lake Merritt Park in Oakland. The woman referred to the danger posed by their charcoal grill, which was not permitted at that spot. The black residents, among them Kenzie Smith, said that she threatened them with jail. A “BBQing While Black” cookout followed, Smith was nominated for a position of the city’s Park and Recreation Advisory Committee and in July he announced a campaign to run for Oakland City Council. Two 23-year-old men were led out of a Philadelphia Starbucks in handcuffs in April because they had not ordered anything while they waited for a business partner to arrive for a meeting. A manager had called the police. The men, Rashon Nelson and Donte Robinson, reached a financial settlement with Starbucks for an undisclosed sum and an offer of a free college education. Starbucks closed its more than 8,000 company-owned coffee shops in the United States and its corporate offices for racial-bias training on the afternoon of May 29. An African-American man was kicked out of an apartment complex pool after an off-duty cop and the apartment manager confronted him and his family. 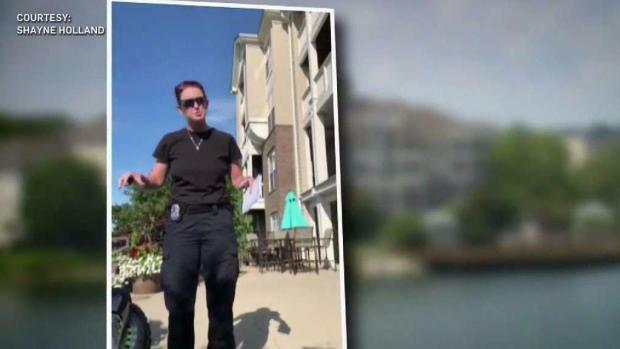 Shane Holland was asked to leave a pool at his own apartment complex in Indiana in July after he showed his key to an off-duty police officer who was providing security at the pool but refused to give her his address. An apartment manager confirmed Holland was a resident but asked him to leave because he had not answered the off-duty officer’s question. The manager was put on administrative leave. Accusations of profiling at swimming pools recurred throughout the summer. On the Fourth of July, a manager of another apartment complex, this one in Memphis, demanded that a black man take off his socks while he dipped his feet in the pool. Kevin Yates refused — he said the ground was hot — and the manager, Erica Walker, called police. Yates' girlfriend, Camry Porter, said that white people who were wearing shirts or hats were not asked to remove them. Walker was fired. Also on the Fourth of July, a white man called police after a black woman would not show him her identification at a community pool in Winston-Salem, North Carolina. The woman, Jazmine Abhulimen, was at the pool with her son when Adam Bloom, the pool chairman of the Glenridge Homeowners Association, asked for her ID. Abhulimen had a key card that allowed her into the pool. Bloom was fired from his job at Sonoco, an international packaging firm, and resigned as pool chairman and from the association’s board. #PoolPatrolPaula. A white woman from Summerville, South Carolina, hit a 15-year-old at a neighborhood pool and was charged with third-degree assault. Stephanie Sebby-Strempel told the teenager and his friends to leave. She was fired from her job as a consultant at skincare company Rodan + Fields. An employee at Smith College in Northampton, Massachusetts, called campus police on a black student who was eating her lunch in a common area while on break from her on-campus summer job in July. The employee said Oumou Kanoute seemed out of place. Smith placed the employee on leave and ordered an external investigation of the incident. The college’s president apologized to Kanoute, who says she felt humiliated and who wants an apology from the employee whom Smith declined to identify. A neighbor called police and reported a possible burglary as four people left an Airbnb in Rialto, California, in April. Three of the four were black and one was a filmmaker and granddaughter of Bob Marley. "The officers came out of their cars demanding us to put our hands in the air," another guest, filmmaker, Kelly Fyffe-Marshall, posted on Instagram. "They informed us that there was also a helicopter tracking us." They sued The Rialto Police Department, saying they had been treated unfairly. The police department says its officer treated the group with dignity and respect. Five black women golfing in Dover Township in York County, a largely white suburb in Pennsylvania, in April were approached by a former county commissioner whose son owns the Grandview Golf Club and told they were playing too slowly. They were asked to leave and threatened with the cancellation of their memberships. Golfers behind the women told The Daily Record that the women had kept up the pace. Police arrived but left quickly and the state Human Rights Commission later held hearings. A woman called police on a black man babysitting two white children in Marietta, Georgia, after the man, Corey Lewis, refused to let her speak to the children. He had taken the children to a Walmart, then a gas station, when the woman followed them. Lewis runs a child care and mentoring business called Inspired By Lewis. The police officer questioned the children and called their parents. An Oregon state lawmaker was reported to police as a “suspicious person” while she was canvassing constituents’ homes in Portland in July. A sheriff’s deputy told Janelle Bynum that a caller said she appeared to casing the neighborhood for unoccupied houses that could be burglarized. When the deputy called the caller, she apologized to Bynum. A black graduate student at Yale University, Lolade Siyonbola, who took a nap in a common room while working on papers, was awakened by a white student whom she said told her she was not supposed to sleep there. The white student called campus police. A Yale vice president called the May episode "troubling" and promised listening sessions with students.